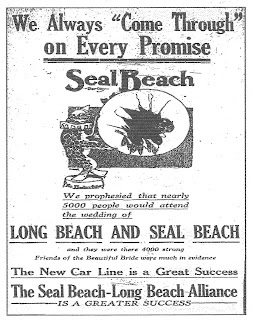 September 1913 was a big month for publicity, making the most of the "wedding" of Seal Beach and Long Beach. Actually the two had married before, a fact promoters failed to mention. In 1904, one year after Bay City was founded, the Pacific Electric line from Long Beach passed through Bay City on its way down the coast to Huntington and Newport Beach. 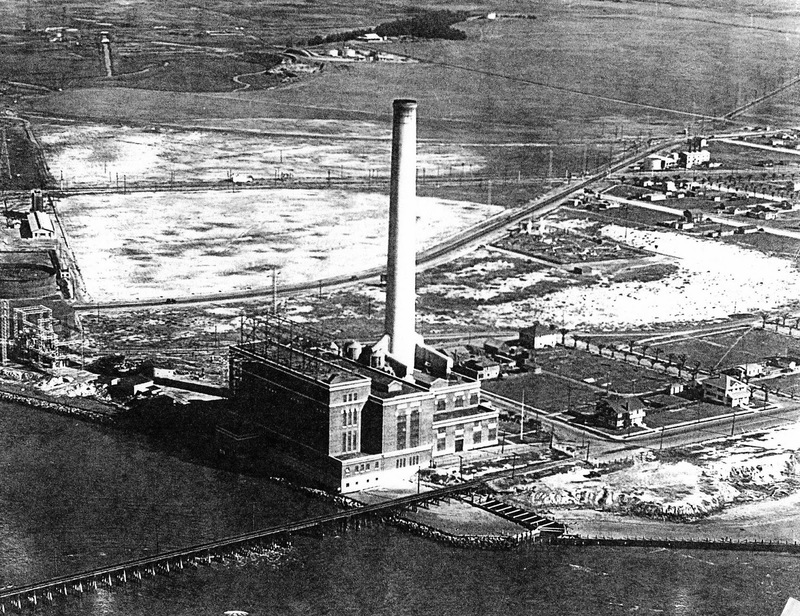 Now, in September 1913, a new electric rail connection with Long Beach was completed via a trestle across the Alamitos Bay entrance channel. Seal Beach and Long Beach will be connected by a new electric street car line and the formal opening of this road will take place on Admission Day, September 9, according to present plans. Cars will be operated every twenty minutes in both directions and a low rate of fare will make Seal Beach a natural suburb of the larger city. The trestle work over Alamitos inlet has been completed and the Pacific Electric railway is now rushing the work on a fill at either end of the trestle. Ties and rails will be laid early in the coming week and it is hoped to have the trains operating regularly by Admission Day. The new amusement building, which is a twin of the dancing pavilion, will probably be opened formally on the same day and Seal Beach will be decorated from stern to stern and every flagstaff will carry national bunting. Considerably over $200,000 worth of property has been sold in the seven weeks of selling, and the Guy M. Rush Company announced that with the completion of the first quarter million dollar sale the prices of all unsold property will be advanced ten percent. This date will probably be not later than September 1. Many residents of Arizona, Colorado, New Mexico and Nevada are buying homes at Seal Beach and a number of investors have taken business property at Seal Beach with the intention of making improvements at once. The barbecue, field day and dance of the printers’ board of trade at Seal Beach yesterday was a complete success in every sense of the word and several hundred happy boosters left late in the day for their homes praising the seals, Seal Beach and the surf without limit. 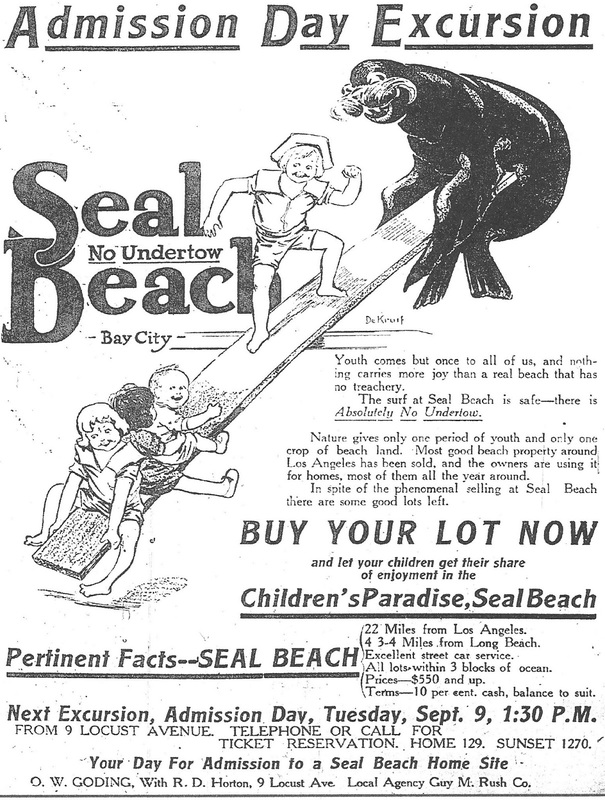 Childhood and beachfront land are limited, as this Sept. 5th ad points out: "Admission Day Excursion. Youth comes but once to all of us, and nothing carries more joy than a real beach that has no treachery. The surf at Seal Beach is safe, there is absolutely no undertow. Nature gives only one period of youth and only one crop of beach land. Most good beach property around Los Angeles has been sold, and the owners are using it for homes, most of them all the year around. In spite of the phenomenal selling at Seal Beach there are some good lots left. Buy your lot now and let your children get their share of enjoyment in the children's paradise, Seal Beach. Pertinent facts--Seal Beach: 22 miles from Los Angeles. 4 3/4 miles from Long Beach. Excellent street car service. All lots within 3 blocks of ocean. Prices---$550 and up. Terms---10 percent cash, balance to suit." The Sept. 6th ad uses the same illustration as the one which appeared one month earlier on August 5th. 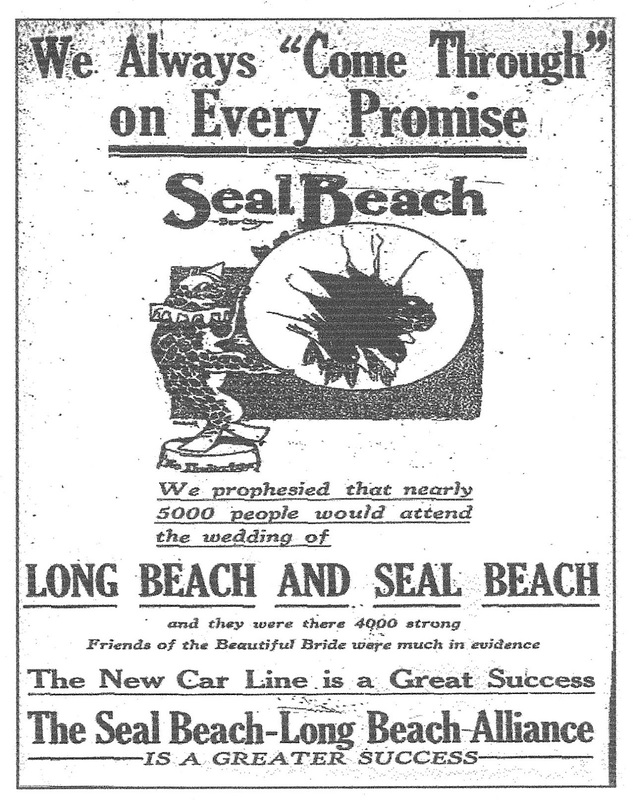 It again talks of the "wedding" of Mr. Seal Beach and Miss Long Beach. Mr. P.E. Railway was to perform the ceremony and Guy M. Rush Company would give the bride away. 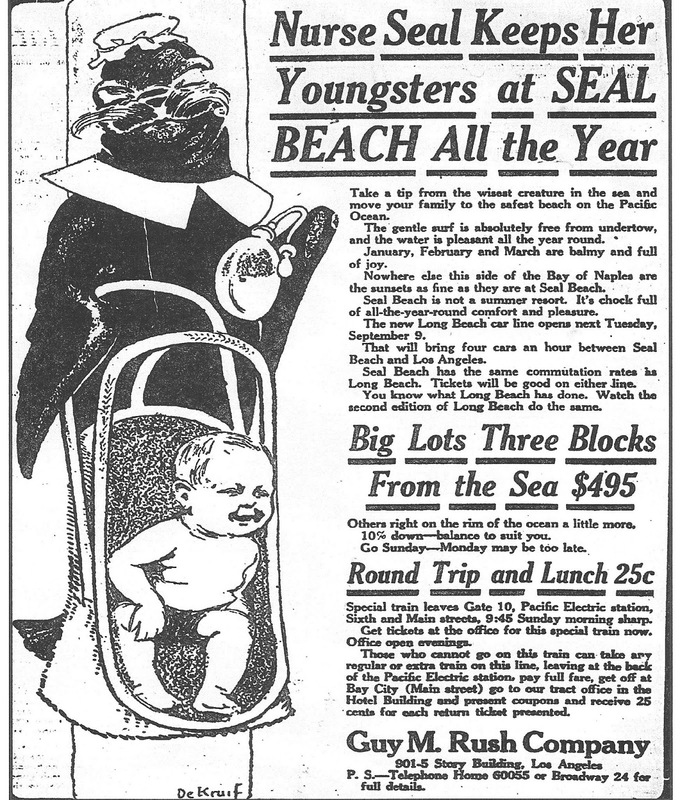 This Sept. 7th ad reveals the year round appeal: "Nurse seal keeps her youngsters at Seal Beach all the year. Take a tip from the wisest creature in the sea and move your family to the safest beach on the Pacific Ocean. The gently surf is absolutely free from undertow, and the water is pleasant all the year round. January, February and March are balmy and full of joy. Nowhere else this side of the Bay of Naples are the sunsets as fine as they are at Seal Beach. Seal Beach is not a summer resort. It's chock full of all-the-year-round comforts and pleasures. The new Long Beach car line opens next Tuesday, September 9. It will bring four cars an hour between Seal Beach and Los Angeles. Seal Beach has the same commutation rates as Long Beach. Tickets will be good on either line. You know what Long Beach has done. Watch the second edition of Long Beach do the same..."
Sales were brisk in the seaside town over Labor Day (which became a Federal holiday in 1894). Prices were to increase 10 percent at midnight September 1. Sales on August 31 and September 1 totaled $67,300, the best weekend of business to date. The new trestle connecting Long Beach and Seal Beach is featured in this ad: "Mayor Seal invites the world to use his new car line today! The last spike has been driven in the Pacific Electric rails over Alamitos Bay. Engineers are working day and night, Sundays and week days to tie Long Beach and Seal Beach together with copper and steal. The work is finished. 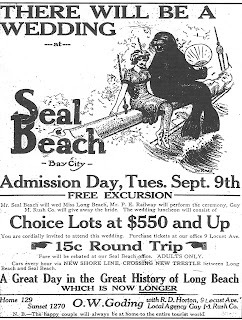 Tomorrow (Admission Day) is Seal Beach Day. Join the throng and see the finest beach on the Pacific Coast. Try the surf---absolutely safe-free from undertoe. Loaf on the sand! Take a motor boat over the tranquil waters of Alamitos Bay. Buy a lot and live in Seal Beach 365 days a year. 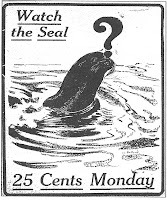 There are only a few left..."
Though the ad also mentions" Mayor Seal," the town would not have a real mayor until it incorporated in 1915. City founder John C. Ord was unanimously elected to that office. He resigned in February 1916, but his successor was recalled in an election a few months later and Judge Ord was again named mayor. By 1918 Ord began a gradual withdrawal from civic duties and sold most of his real estate concerns before his death on January 14, 1937, at the age of 94. Long Beach was married today. At exactly 6:35 o'clock this morning the hands that 'ne-er do us part," were welded together and Long Beach took under its wing, promising to aid, care for and protect, its spouse, Seal Beach. The bands have been published in scores of newspapers in Southern California during the past two weeks and the news of the fashionable, far-reaching event was scattered by every known means of modern advertising. This publicity fact insured an attendance from the prosperous, the boosters and well wishers, who added to the meaning of the occasion by their presence. In other words, Seal Beach, destined to become one of the finest and best resorts and resident centers of the south coast, was this morning officially opened with the completion of the P.E. tracks from Naples to the new beach townsite. Just about 7 o'clock last night, just as the evening shadows were deepening and the workaday world was out seeking its amusement, the last spike in the steel rail connecting link between Long Beach and Seal Beach was driven. Then, after a close inspection by officials of the company, the line was thrown open for traffic, the first car passing over it being that filled with railroad officials and officials of the Guy M. Rush company, owners of the beach town tract. From that minute on the 'weddin' crowd began to assemble in both Long Beach and Los Angeles to attend the ceremony at Seal Beach and to see with their own eyes the wonders accomplished there by man in bringing out the beauteous features that nature had already provided at that beach. By noon, on a conservative estimate, there were 3000 people at Seal Beach and all were having the time of their lives. For the Rush company had provided 1,000 free lunches, including sandwiches, fruit and coffee for all comers. Courteous guides met each train on its arrival before the tract office and escorted parties through the new pavilion, out on the pier then later in detached groups the visitors were taken on auto rides to the bay and through the tract. Of course there were scores who were interested in getting in on the ground floor for the purchase of real estate, but there were a majority who came to spend the day picnicking and sightseeing. And they all enjoyed themselves. The seals were the big attraction. The monster denizens of the deep, who are making the bay at Seal Beach their home and for whom the new and coming city was named, attracted the attention of all visitors. When the excursionists arrived in Seal Beach they found the townsmen with their arms wide open in welcome. The town was in full gala trim and buntings and flags hung from every vantage point. On arrival in Seal Beach visitors were astonished at the work of improvement...these include a magnificent pavilion, skirting the 500-foot pier, a fine dance pavilion and the beginning of the construction of the proposed mile-long bulwark and walk. The pavilion houses the bath house, a dance hall, bowling and billiard alleys and space for a large and up-to-date cafe. Mr. Guy M. Rush reported that Seal Beach has broken all realty records of Southern California as $352,000 worth of property had been sold in the division since his company assumed the ownership of the plat early in July. All but 105 lots had been sold when the opening day dawned and company agents predicted that a majority of these would pass into the hands of private owners before the day was over. Possessing only 75 houses last year, Bay City today boasts of a thriving population of nearly 300 people, and over 200 homes. The town, which at the present time is under the jurisdiction of the county supervisors, contemplates incorporation before the passing of another year. It was founded and laid out in 1904 by the Bayside Land company, of Los Angeles, which controlled the property at that time. An 1800 foot pleasure pier, which is still standing and in good condition, a dancing pavilion, and thousands of dollars in street work, were the principal improvements made by the first three years of the existence of the town. This brings the history of Bay City up to 1907, the time of the financial panic. At this time the property was taken off the market, not to be submitted to public sale until this time last year. Since then building activity and the promotion of general improvements has taken on an animated appearance, with no let-up in sight at the present time. The townsite of Bay City comprises 320 acres, blending into 14,000 acres of proven fertile farming land stretching back from the sea. The streets are graded and well laid out. The city has electricity, an excellent water supply, telephones and cement walks. 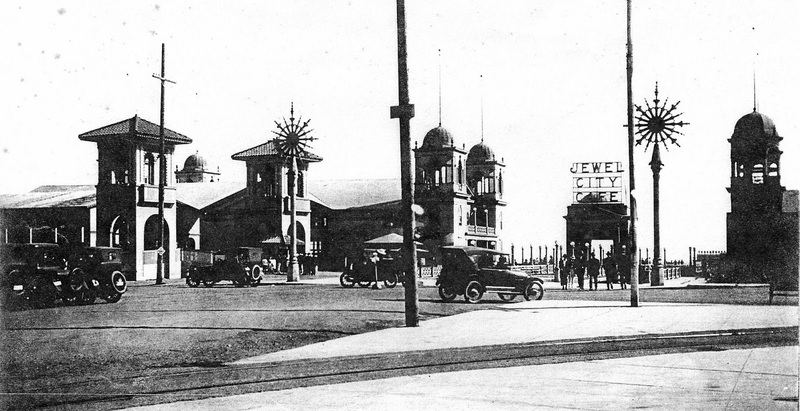 In addition to the pier, a source of enjoyment to anglers and promenaders, and the handsome twin pavilion, said to be similar to the famous twin pavilion of Atlantic City, and one of the finest amusement places of its kind on the Pacific seaboard, Bay City has two general stores, post office, restaurant, meat market, and a combination hotel and cafe, in addition to other smaller business places. It is estimated that at the present time there are eighteen miles of sidewalks and curbing in Bay City within the townsite limits, and twelve miles of oil and graded streets. 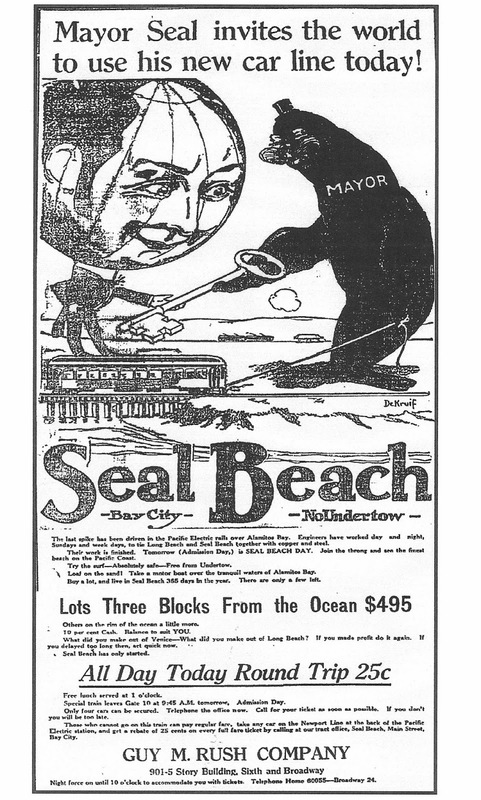 The name "Seal Beach" has been bestowed upon Bay City by enterprising real estate dealers, owing to the advantage to be derived from the advertisement of such a name, inasmuch as a colony of over 200 seals make their home in the waters lapping the sands of Bay City. 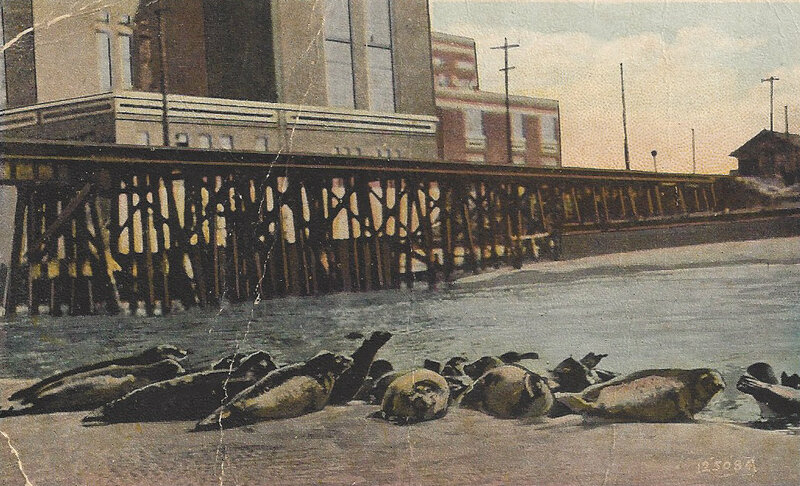 Owing to the recent work on the Alamitos Bay - Bay City Pacific Electric trestle, the seals have been frightened away from the beach during the working hours of the day, but may be found in large numbers basking in the early morning sunlight or wallowing in the warm sand during the final shining moments of the descending sun, after the noisy workmen have laid down their tools, picked up their lunch boxes and left for the day. 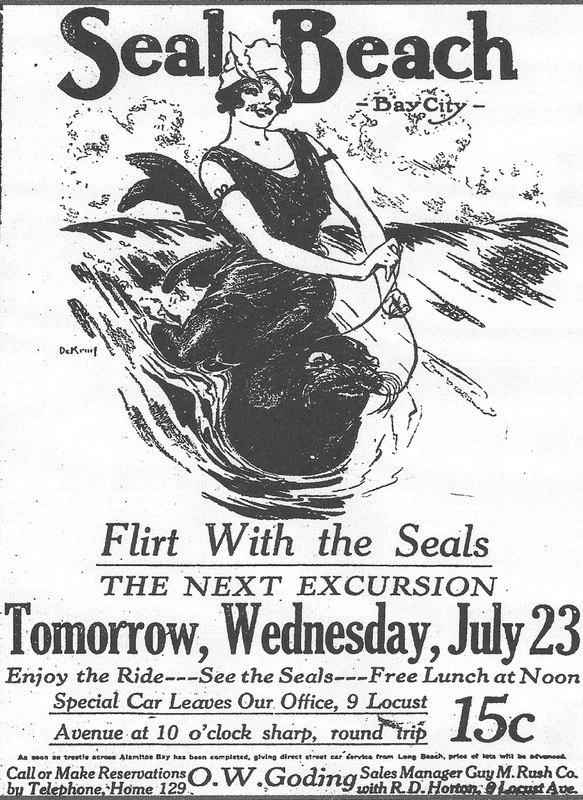 A three-day honeymoon was enough for Mr. and Mrs. Seal Beach. The weather in the interior was incredibly hot, and the couple was anxious to get back to the cool ocean breezes of Seal Beach. 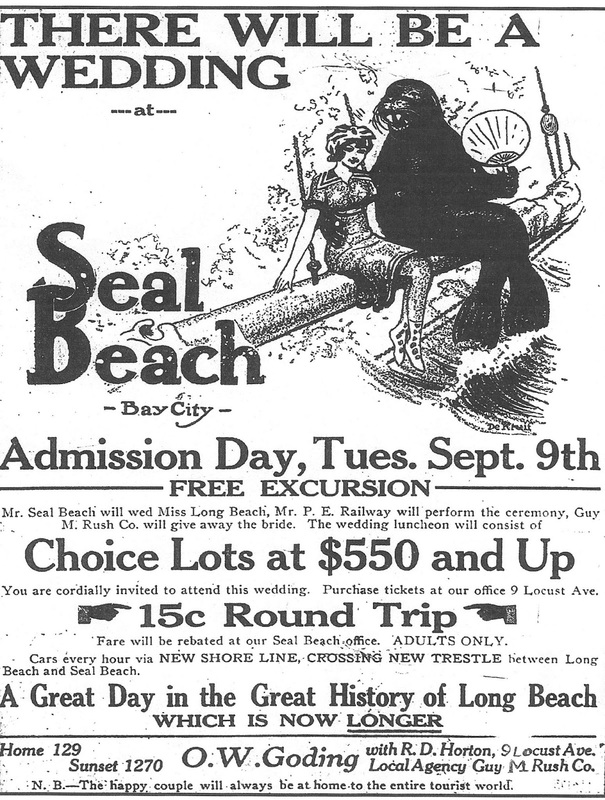 The Sept. 12th ad reveals that: "Mr. and Mrs. Seal Beach have returned from their honeymoon and are at home to the world in their beautiful Seal Beach castle just beyond the new Alamitos Bay trestle. When a Telegram reporter called on Mr. and Mrs. Seal Beach their Royal Highnesses issued the following statement: 'We are glad to be back in Seal Beach after our wedding tour. The weather in the interior is indescribably hot; but here at Seal Beach the ocean breezes are always delightfully cool. We are delighted with our surroundings and new neighbors. The surf here is beyond compare, the still water bathing and boating are the best ever, and talk about fishing is simply immense...'"
Company agents had hoped the 105 remaining lots would have sold on "wedding" day, but they had not. By the time of this ad, prices of the lots had again gone down to $495. The ten-percent increase that was to go into effect at midnight on September 1st did not happen. 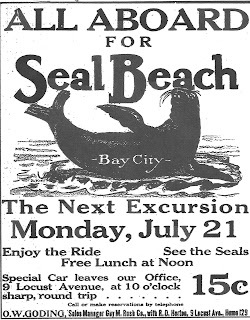 People were visiting Seal Beach and traveling on the new electric railway line. 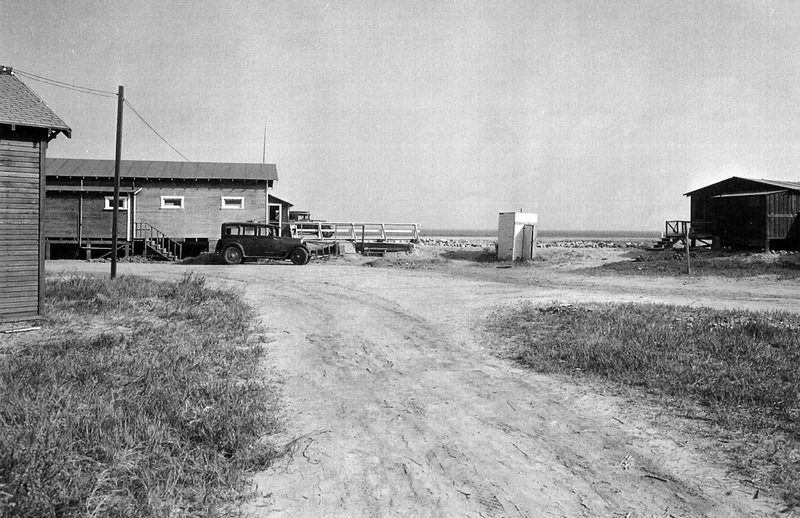 In addition to the pier and twin pavilions, travelers found two general stores, a post office, restaurant, meat market and a combination hotel and cafe. The Pacific Electric left Los Angeles for the forty-four minute trip to Seal Beach every hour, the fare was .35 cents one way, .50 cents for a round trip ticket. 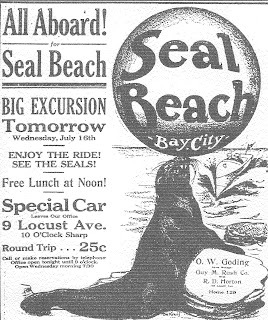 This Sept. 15th ad calls for all to board the Long Beach-Seal Beach Flyer: "All aboard for Seal Beach. Accompany conductor seal over the new scenic Long Beach-Seal Beach line. 500 people visited Seal Beach yesterday. Were you among them? 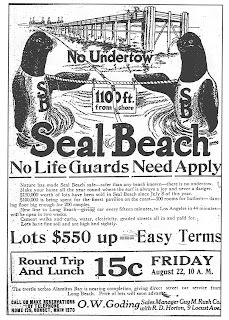 If not, you had better go over today --- lots are getting scarce --- and remember this one fact, Seal Beach is the last elevated ocean frontage between Santa Monica and Balboa, and the prices are bed rock. Lots $495 and up. Terms very easy...Go where things are doing. Over $200,000 worth of improvement already made. Over $150,000 more improvements to be made. Surf and still water bathing, fine boating and fishing. Be in at the birth of a city and profit by the delightful experience of city building." By the 1930's more than 900 cars traveled the 1,150 miles of P.E. track which criss crossed Los Angeles, Orange, Riverside and San Bernardino Counties. 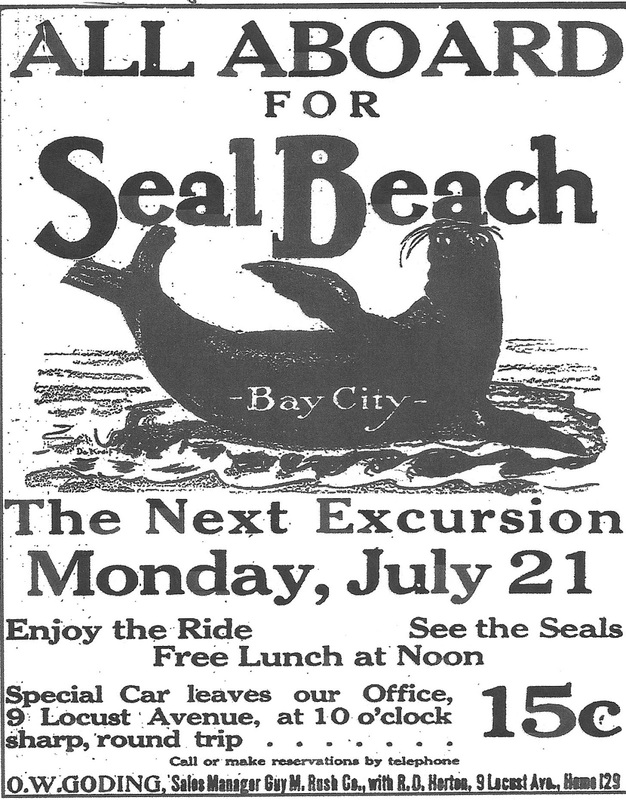 Sadly passenger service on the Pacific Electric through Seal Beach would end on July 2, 1950. Freight service continued until the mid 1950's, but on April 8, 1961 all Pacific Electric service ended. Trucks, cars and buses had supplanted the old mode of transportation. "'Whew!--good-bye,' said Mr Seal to his business associates at his Los Angeles office yesterday. 'I am going back to the coolest spot on the coast.' When business interferes with your comfort quit the business. 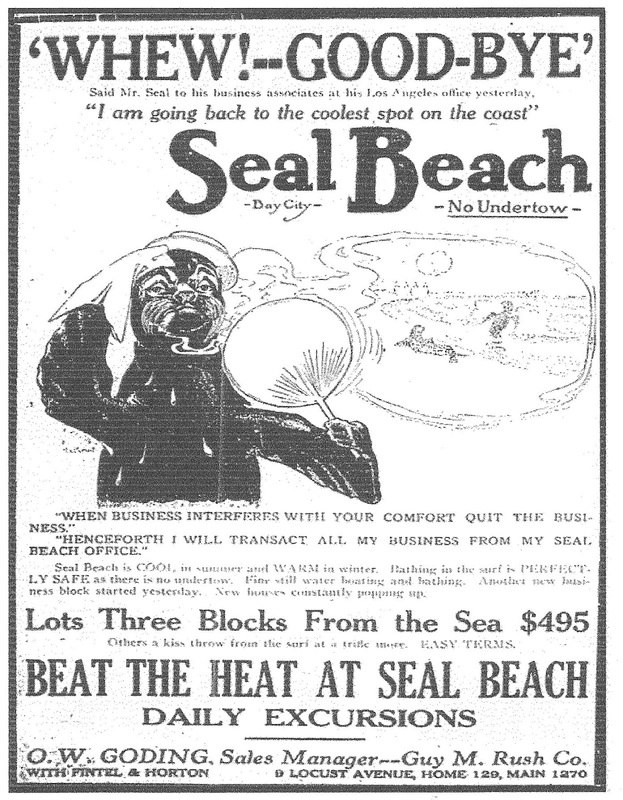 'Henceforth I will transact all my business from my Seal Beach office.' Seal Beach is cool in summer and warm in winter. Bathing in the surf is perfectly safe as there is no undertow. Fine still water boating and bathing. another new business block started yesterday. New houses constantly popping up..."
can't get hot. Cool breezes blow all summer long at Seal Beach. Balmy days fill out the winter at Seal Beach. 365 days in the year the surf at Seal Beach is perfect, no undertow! 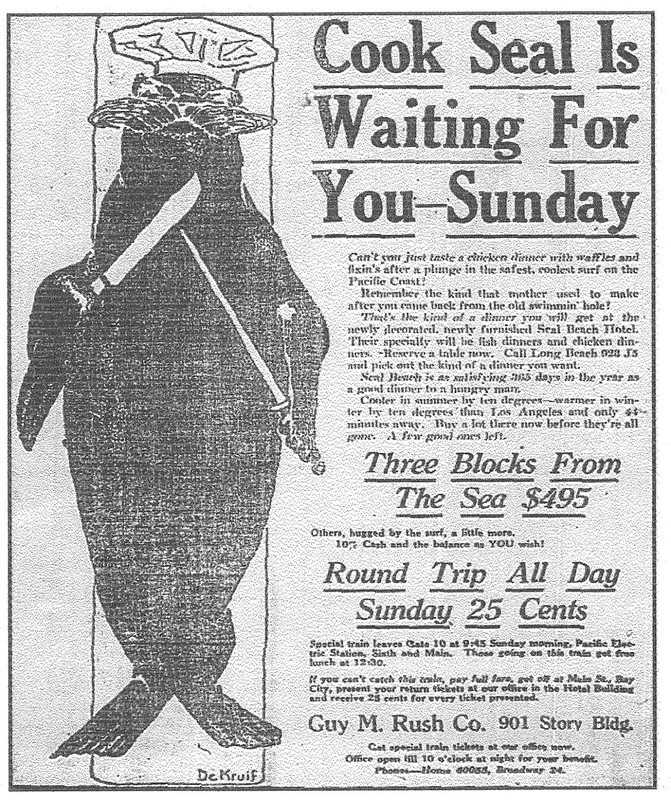 Why not insure forever against the heat---buy a lot at Seal Beach..."
"Cook Seal is waiting for you--Sunday. Can't you just taste a chicken dinner with waffles and fixin's after a plunge in the safest, coolest surf on the Pacific Coast! Remember the kind that mother used to make after you came back from the old swimmin' hole? That's the kind of a dinner you will get at the newly decorated, newly furnished Seal Beach Hotel. their specialty will be fish dinners and chicken dinners. Reserve a table now..."
As the ad states, the Seal Beach Hotel was renovated and a celebrated chef hired. What better way to spend an evening---you could dine at the hotel and then go dancing at the pavilion by the pier! 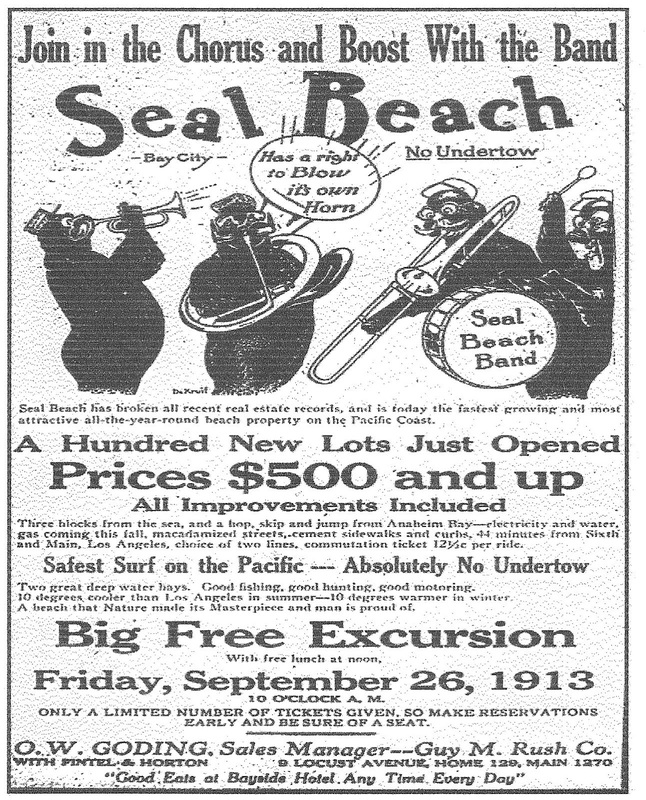 The Seal Beach Hotel (later re-named the Seal Beach Inn) came to offer other forms of entertainment. In September 1923, the owner Mildred J. Blankenship and seven men, were arrested and later released on $5,000 bail. On the second floor of the hotel roulette wheels and other illegal gambling devices were found. 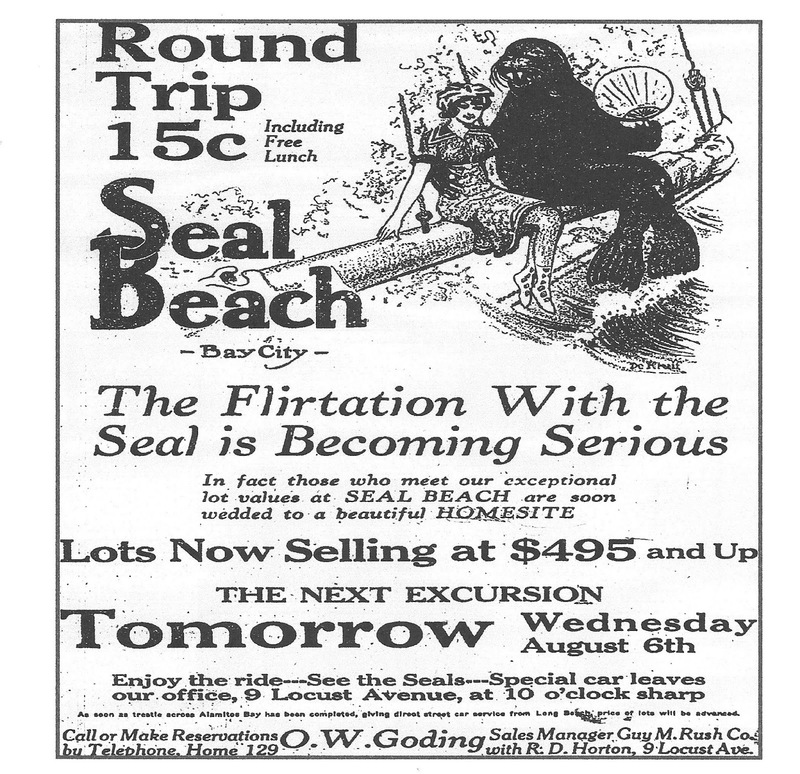 Seal Beach was gaining a reputation as a "wicked" place. 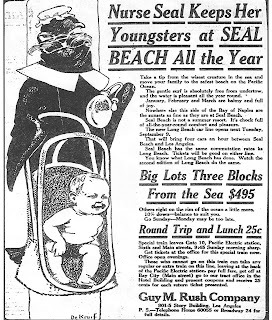 One Long Beach clergyman preached a sermon entitled, " a Moral Hell," with Seal Beach obviously in mind. Boulevard (now Seal Beach Boulevard) and Pacific Coast Highway. 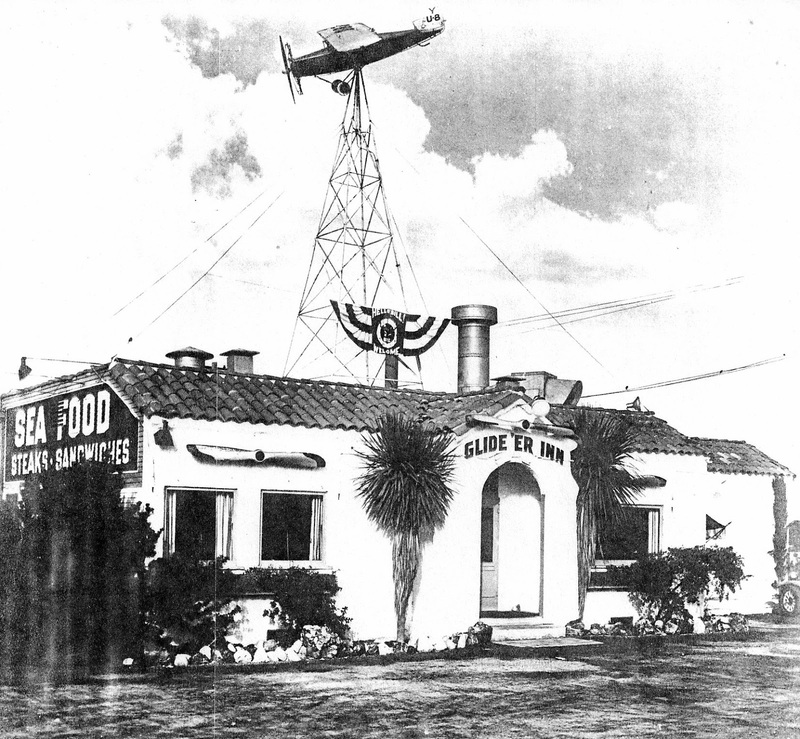 The Glider Inn was known for the aeronautical memorabilia which lined the walls, model planes which hung from the ceiling and a pilot's register with signatures and notations by hundreds of pilots. The amount of traffic being carried on the new Long Beach-Seal Beach line of the Pacific Electric Railway is a revelation to all. Twenty-minute service will be inaugurated tomorrow and when the filling of the approaches to the new trestle across Alamitos Bay is completed, cars will run on this schedule at all times. This will give the residents of Seal Beach four cars an hour to Los Angeles. Ten new residences are in the course of construction here at the present time. During the past week W.S. Chorn began the erection of a business block on Main Street, directly opposite the hotel building, and on the adjoining 100 feet another two-story building will be started within sixty days. A two-story brick or concrete building will be started in December by J. W. Griffith, a capitalist of Cripple Creek, Colo., on the corner opposite the hotel. The contract calls for several handsomely finished stores on the lower floor, and apartments above. This work will be started in December. "Join in the chorus and boost with the band. Seal Beach. Seal Beach has broken all recent real estate records and is today the fastest growing and most attractive all-the year round beach property on the Pacific Coast. a hundred new lots just opened. prices $500 and up. All improvements included. three blocks from the sea, and a hop, skip and jump from Anaheim Bay---electricity and water, gas coming this fall, macadamized streets, cement sidewalks and curbs, 44 minutes from Sixth and Main, Los Angeles, choice of two lines, commutation ticket 12/1/2 cents per ride. A new subdivision opened, placing 100 additional lots on the market. Called Bay View Heights, it was located three blocks from the ocean adjacent to the school site. The price for lots was raised $5, placing the starting purchasing price at $500. The costlier lots were $1100. Contrary to the general supposition that Seal Beach, the thriving new resort east of Long Beach, across Alamitos Bay is to be a wide open town, R.D. Horton, local representative of the Guy M. Rush Company, promoters of the resort, states that it is to be as "dry" as Long Beach. Prohibitive clauses are contained in every deed and no license will be granted to sell liquor as a beverage. Well, R.D. Horton didn't get his facts straight. 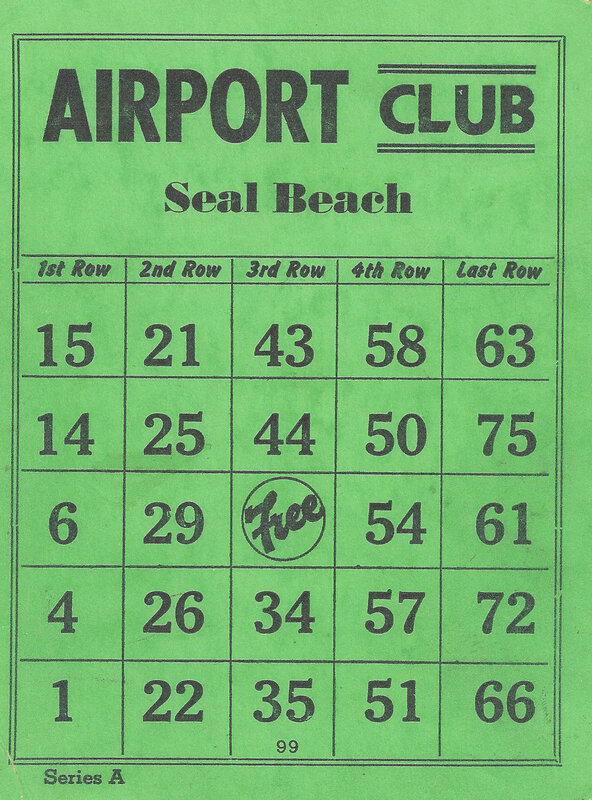 Not only did Seal Beach become one of the "hot spots" for illegal liquor, it also became a Mecca for gambling....something that wasn't remedied until Seal Beach residents voted in May 1953 to close the notorious Airport Club, a Quonset poker palace, owned by ex L.A. police officer William L. Robinson. A wake for the poker parlor was held May 20, 1953, for the club that had operated on a 24-hour basis since its opening June 9, 1950. As a gesture of appreciation for the mourning poker populace, Robertson had ham sandwiches and coffee passed out freely after the last hands were played at 11 p.m. This was just the first step in getting gambling out of the city. On October 20, 1954, by a vote of 605 to 516, Seal Beach residents approved a new city ordinance banning all forms of professional gambling, not just poker. 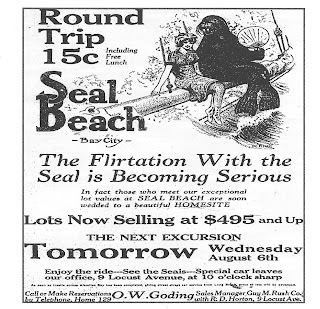 Newspapers advertising the new resort of Seal Beach touted it as being a place of romance. Many a single man and unmarried woman came to the sea shore, cast aside their worries and found a congenial companion to share the rest of their lives with...or so the ads led you to believe. "Cupid seal is matching hearts every day. Seal Beach, no undertow. Watch the little love god cut capers at the best and safest beach on the Pacific Coast. 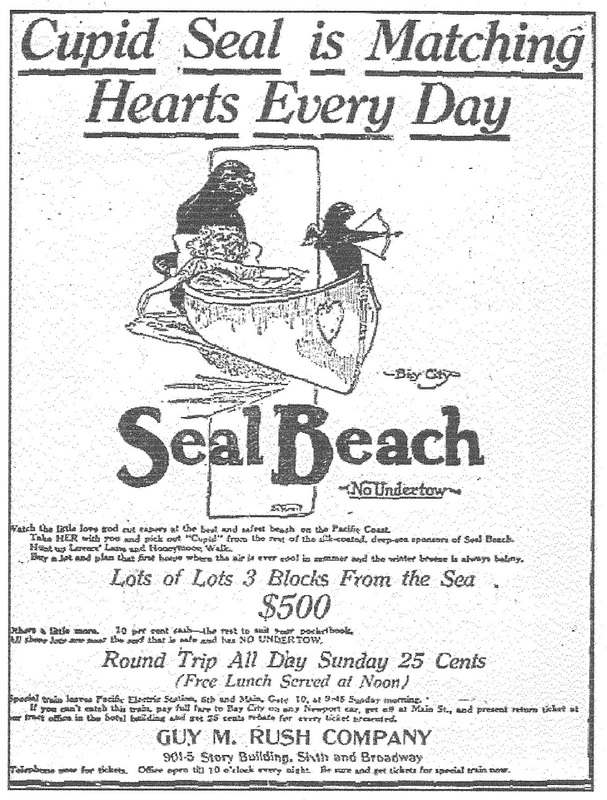 Take her with you and pick out "cupid" from the rest of the silk-coated, deep-sea sponsors of Seal Beach. Head up Lovers' Lane and Honeymoon Walk. 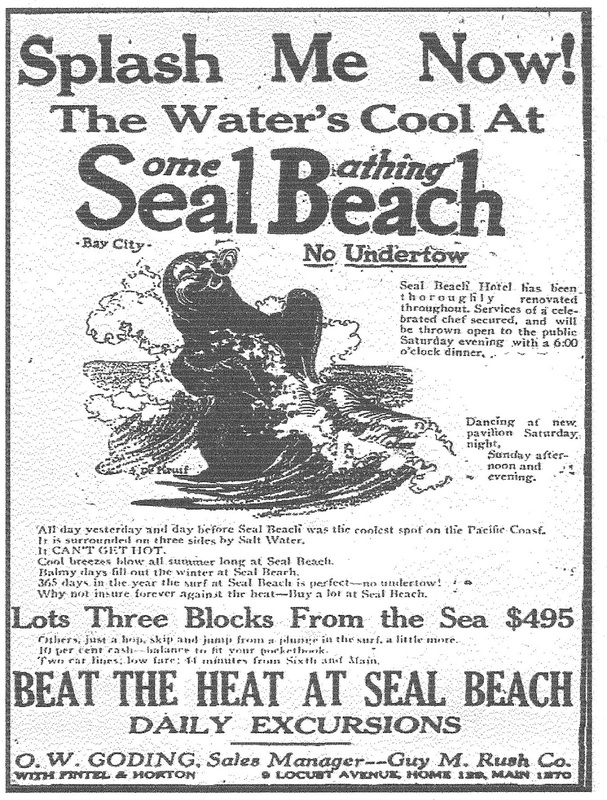 Buy a lot and plan that first house where the air is ever cool in summer and the winter breeze is always balmy..."
Step back to 1913 and relive the “selling of Seal Beach” in these drawings and articles. The illustrations are presented chronologically, as readers in 1913-14 would have found them. 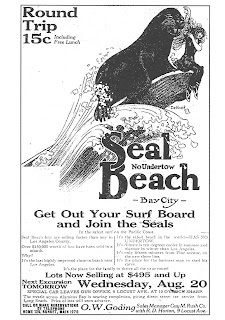 In addition to the illustrations, articles about Bay City (soon to become Seal Beach) were featured. 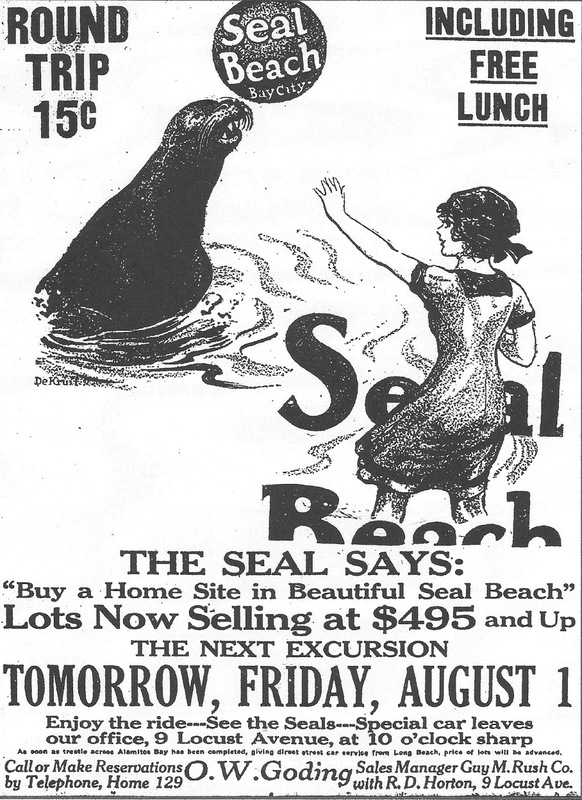 The first ads for what would later be revealed to be Seal Beach appeared on July 9, 1913, and were “teasers” to catch the public’s attention. No mention was given as to what the ad was about, but the question mark led you to believe that more information was to come. 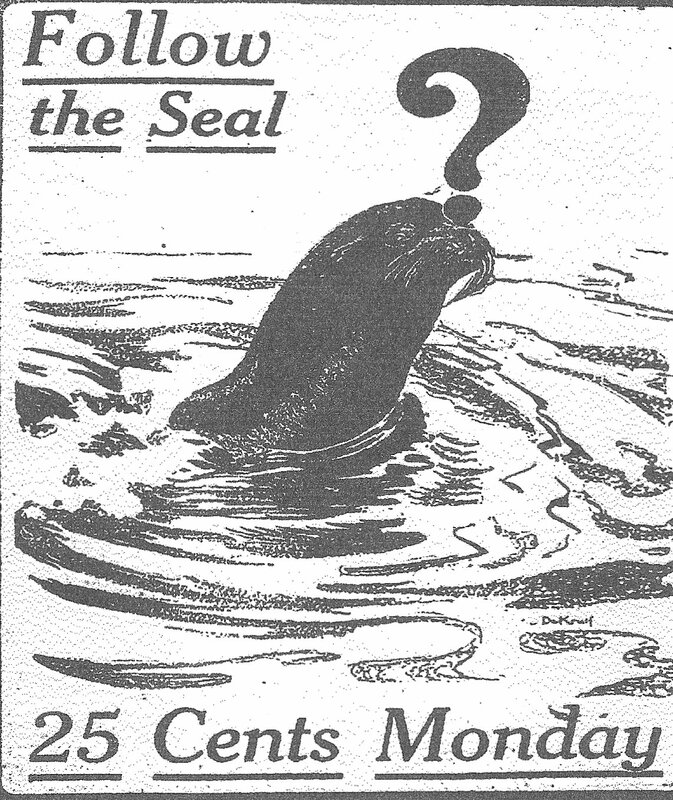 An ad similar to the first appeared the next day in the Daily Telegram. Ads also started to appear in the Los Angeles Times and Long Beach Press. O.W. Goding, of the Guy M. Rush Company of Los Angeles, has opened up headquarters with R.D. Horton, 9 Locust Avenue, exclusive agents for Seal Beach, from which place this property will be handled. Excursions will be run to this property each Monday, Wednesday and Saturday, during this month and Mr. Goding says that the fare will be so reasonable and the program for entertaining will be of such character that he expects to haul capacity crowds on each excursion. This property is located just a few miles below Long Beach and is known to the old-timers as Bay City. Since Mr. Rush took over the property great improvements have been made and thousands of dollars are yet to be spent. It is the intention of the company to keep on improving this nature’s beauty spot until it will be second to none on the coast. The fact that Guy M. Rush Company is handling it and the further fact that the local representatives are men of high sanding for square dealings, is a pretty good guarantee that Seal Beach will become one of the most popular beach resorts on the coast. 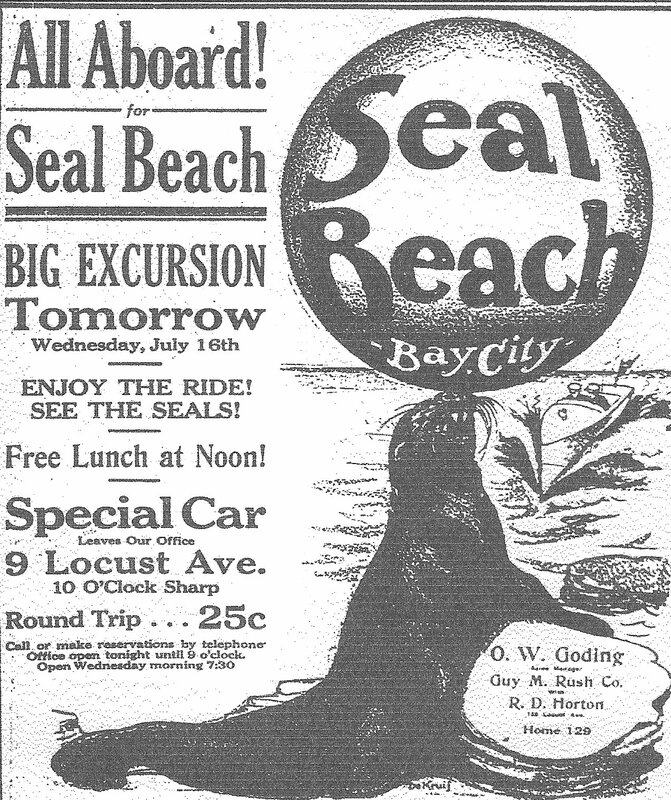 Friday, July 11, 1913, the ad revealed the mysterious seal was advertising Seal Beach, also identified in the drawing as Bay City. Prices for lots started at $495. The time to open the resort was perfect. 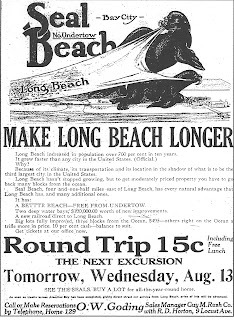 The Pacific Electric had just introduced its summer beach rates. The ad states: "Go and See the Seals Now - See 200 of them in the water at this famous beach. Only 44 minutes from the heart of Los Angeles. 4 1/2 miles from Long Beach. The safest beach in the world. Absolutely no undertow. The only beach with two still water bays, a big back country and a mile of the finest bathing beach in the world. Beach Bait’s Brace of Bits; Big Bunch Bites. First Thursday of the Summer on Which Twenty-five-cent Rate to the Seaside is Effective; Company Estimate is Forty Thousand Fares. With city asphalt reduced to the consistency of a huge omelet, and a summer sun getting its best licks for the year, the Pacific Electric called the turn when it selected yesterday for the first of the half-fare, two-bit, round-trip excursions to the sea shore. The surprising feature of the ocean exodus was not the number of persons who went to listen to the secrets of the waves as much as that there were any left in town to paddle around in wilted collars and disarranged tempers. At the hill Street station it looked as though the metropolis was being depopulated…The special rates will be in effect every Thursday during the remainder of the summer alternating between Long Beach, San Pedro, Bay City and Anaheim Landing, and Santa Monica, Ocean Park, Playa del Rey, Venice and Redondo. 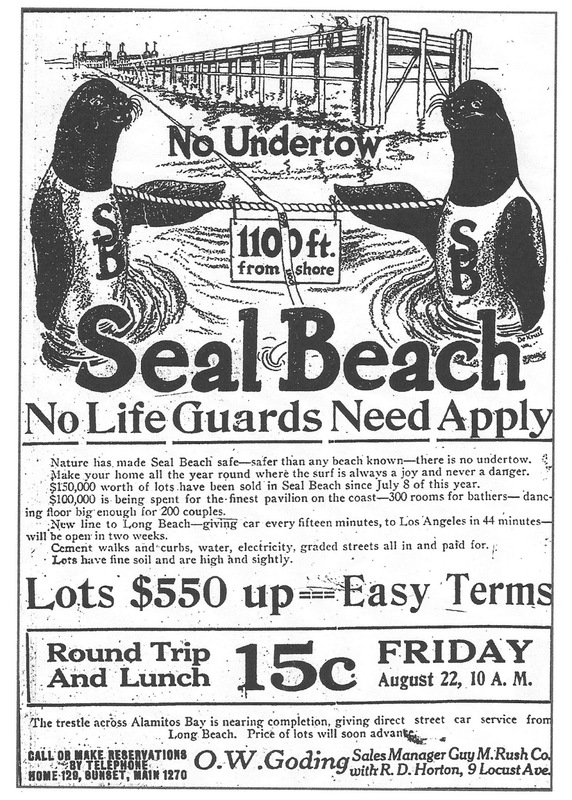 How would you like to see 200 live frolicking seals disporting themselves in the placid waters at Seal Beach? That’s what you can see next Monday, if you go down on the excursion which is advertised in this issue of the paper by Mr. Goding, southern manager of the Guy M. Rush Company of Los Angeles. The company has spent over $100,000 in improvements at Seal Beach, Bay City, and will run their first excursion from Long Beach next Monday morning, special train leaving the P.E. (Pacific electric) station at 10 a.m. A splendid program has been prepared for the entertainment of those who make the trip, together with a free lunch which will be served on the beach, where you can see the seals play their latest and most entertaining games…the electric line from Long Beach to Seal Beach will be completed by the middle of next month, which will bring the place within a few minutes ride of this city. TOWN RENAMED: Bay City Hereafter to be Known as Seal Beach – Work Begun on Huge Trestle. 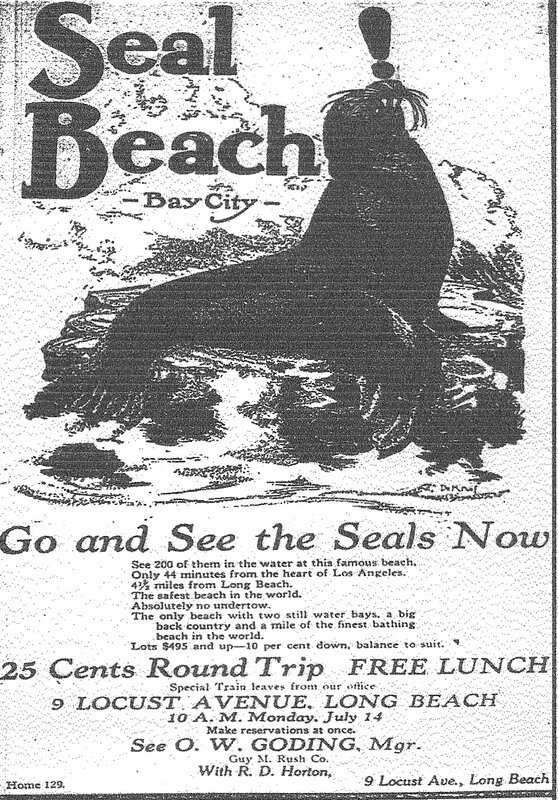 Two hundred seals have adopted Bay City as their natural home, and are responsible for the change of the name of this thriving South Coast resort from Bay City to Seal Beach. These seals have been arriving in increasing numbers each year and have made their particular headquarters in a little inlet entering Alamitos Bay. Right at this point the new trestle connecting the Bay City branch of the Pacific Electric with the present line is being built. One of the incidents of the building of this trestle will be the creation of one or more rock islands near the shore, where the seals may sun themselves and the appointment of a seal keeper by the Pacific Electric Railway Company. Work on the 700-foot trestle began early in the week, and large gangs of men are busy making up for lost time in the connecting up of this railroad, which will make a direct line from Long Beach to Bay City, or Seal Beach. This bridge will be completed early in August. Never was a happier crowd than the 2000 who flocked to Bay City yesterday to enjoy the first outing of the Federated Improvement Association and the christening of Seal Beach. When they arrived on the grounds the Bay City Company, under the leadership of its president, P.A. Stanton, had the fresco luncheon ready. The tables were piled high with heaps of barbecued beef, tubs filled with frijoles, buns, pickles and other toothables, besides barrels of coffee. In order to determine which improvement association had the greatest percentage of its members present, the serving table was fenced off and the only way to reach it was through the gates at one end, each person being required to present a ticket. The tickets cost nothing, but this seemed to be the only way to determine which association was there in greater force. Then there was an hour or two to spend in the surf before the speech making began. The handsome new pavilion is almost completed and the under portion, which is devoted to a bath-house, was fitted up ready for action. Big and little, old and young, scrambled into bathing suits and had the time of their lives. Some of the ladies who didn’t care to get wet all over took off their shoes and—and—stockings, tucked their “toadies” up fore and aft until they looked like troubadours, waded in the surf-and some of them managed to get wet just about all over. But it was a jolly crowd and everything went. The occasion was graced by the presence of May Rose (of Los Angeles) who made a short speech in which he said he appeared there as a private citizen, offering his heartiest congratulations to the organization that he declared was the result of protests against unjust taxation. P.A. Stanton, in welcoming the crowd to the new Seal Beach, said they had no barbecued seal meat, but those who wished to see the real live “water birds” could walk up the beach and take a look at them. Following the speech making, the grand march took place as a dedication of the new pavilion, which has a fine maple floor and when completed will be one of the finest pavilions on the Coast…Nearly the entire crowd took part in the grand march to the music of an orchestra, after which there was a general dance. Those who did not care to dance went outside and took part in the races and other amusements…A handsome loving-cup, about eighteen inches high and valued at $125, was awarded the North Main Street Improvement Association as the one having the largest percentage of its membership at the picnic. Seal Beach is one of the best on the Coast. It is clean as if swept with a broom and the shallow offing extends far out toward the end of the pier, and there is no undertow. It is destined to become one of the favorite bathing beaches, though not so near the city (Los Angeles) as some of the others. Interesting news regarding road improvements in the vicinity of Long Beach was given the East Side Civic League last night by Supervisor W.E. Hinshaw…Mr. Hinshaw told of the work in progress on the boulevard between Long Beach and Bay City and said that the road would be paved and completed within 60 days. A paved boulevard, skirting the ocean’s edge closely for twenty-five miles from Long Beach to Balboa, is now assured. The Board of Supervisors have voted to appropriate $20,000 to complete the road from Bay City south to Balboa and the latter city is prepared to pave its road from Main Street to the northern limits of the city at the Santa Ana bridge. The road from Long Beach to Bay City has already been built and the new work, which will be undertaken at once, will complete one of the best and most beautiful ocean drives on the Coast. The long boulevard is sure to be a favorite with automobilists because of the beauty of the surroundings and the level grade. For several miles of the distance it will skirt the open ocean on one side with the inner bay on the other. The California Department of Fish and Game says most of the animals in our coastal area are really sea lions, with an occasional harbor seal thrown in. Sometimes people have a hard time telling them apart. Supposedly, it is quite easy to distinguish a sea lion from a seal. Sea lions have external ears and can fold their hind flippers under them. Harbor seals appear “spotted” when they dry out, they are also more “sausage” like in appearance. 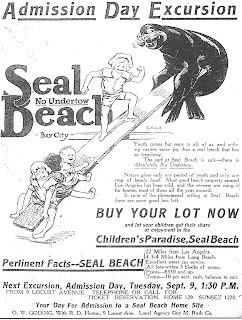 To early journalists, however, the harbor seal and California sea lion were simple “seals.” If they had distinguished between the two, the more appropriate name for the new community would have been Sea Lion Beach. “Since the Guy M. Rush Company took over the sale of Seal Beach and began running excursions from the local offices at 9 Locust Avenue sixty lots have been sold,” said Mr. Goding, local manager. All of the improvements now under way at Seal Beach, Bay City, are being rushed through as rapidly as possible. The Pacific Electric Long Beach-Seal Beach line will probably be in operation within a short time, as the trestle across the mouth of Alamitos Bay was started this week. The new pavilion, although not entirely completed, is ready for occupancy, the bath house department having been in business since July 17, when it was initiated by the members of the Federated Improvement Association of Los Angeles. The dance hall was also dedicated at this time by the visitors. The Bay View Hotel has been opened for the season. The illustrations seen here are all different; however, many were used over again at different times to advertise the new township. 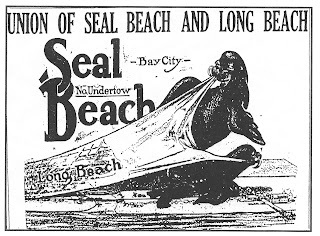 During the summer of 1913 three to four ads a week ran in the two major Long Beach newspapers, the Daily Telegram and the Long Beach Press as well as the Los Angeles Times. “It’s a bear” and it’s at Seal Beach and, too, there are lots of seals there. No occasion here for one to imagine a row between a member of the bruin family and the docile amphibians sporting in the waters at Seal Beach, however. The facts are that the sales out at Seal Beach are an “ursa major” of a success and the excursions, run from Long Beach at stated intervals for some time past, are bearing many people who invest after they view the tract and its charming surroundings. A bare statement of facts as outlined by R.D. Horton and O.W. Goding, who are Long Beach representatives for Seal Beach tract, justifies this comment. These men are not neglecting even the creature comforts of their excursionists, serving an appetizing luncheon to all who go. 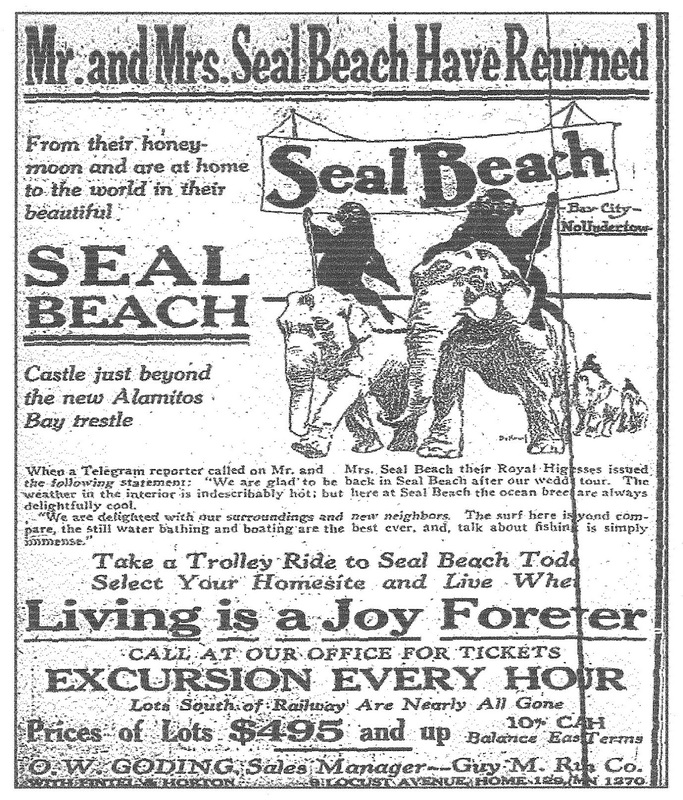 With the announcement of the rushing of work on the amusement buildings at Seal Beach comes a simultaneous announcement that the new resort and residence district has already attained for itself a prominent place of popularity among the beaches. During the week five or six different organizations were at Seal Beach negotiating for accommodations for outings. The “Woman’s Million Club,” headed by Mrs. Clara Shortridge Foltz, will hold its annual outing at the beach on August 16. The members of the club will be taken to Seal Beach in special parlor cars and an al fresco luncheon will be served. Now that the pavilion is in full use the number of people arriving daily and is said to be increasing. Three hundred dressing rooms for the use of the surf bathers are now available. The dancing pavilion, the floor of which is large enough to accommodate more than 200 couples, is said to be one of the finest on the coast. The second building, it is expected, will be completed by the time the new Seal Beach-Long Beach line is in operation. The new building will contain an assembly hall, moving picture hall, billiard hall and bowling alley. 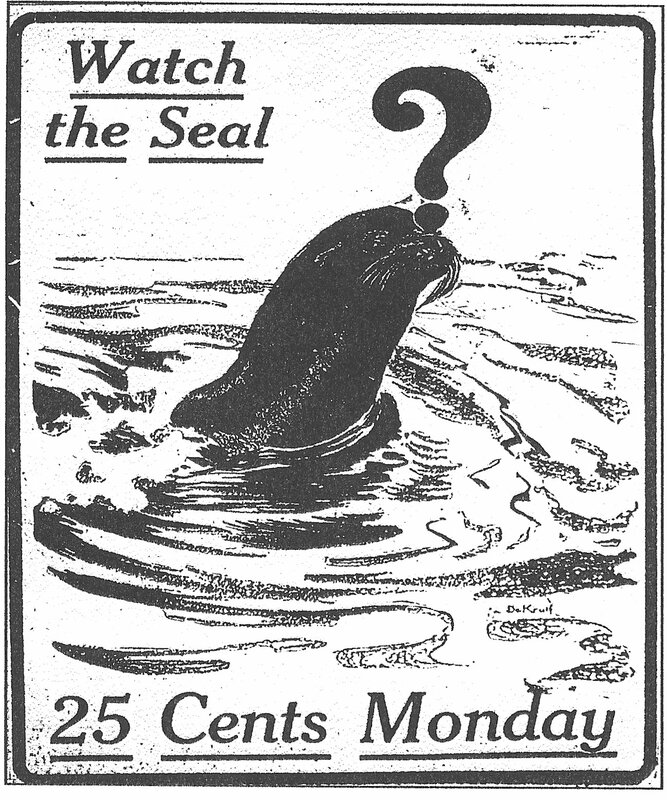 This Aug. 5th ad is the first in which the hint of a "wedding" is mentioned: "The Flirtation With the Seal is Becoming Serious. In fact those who meet our exceptional lot values at Seal Beach are soon wedded to a beautiful homesite." 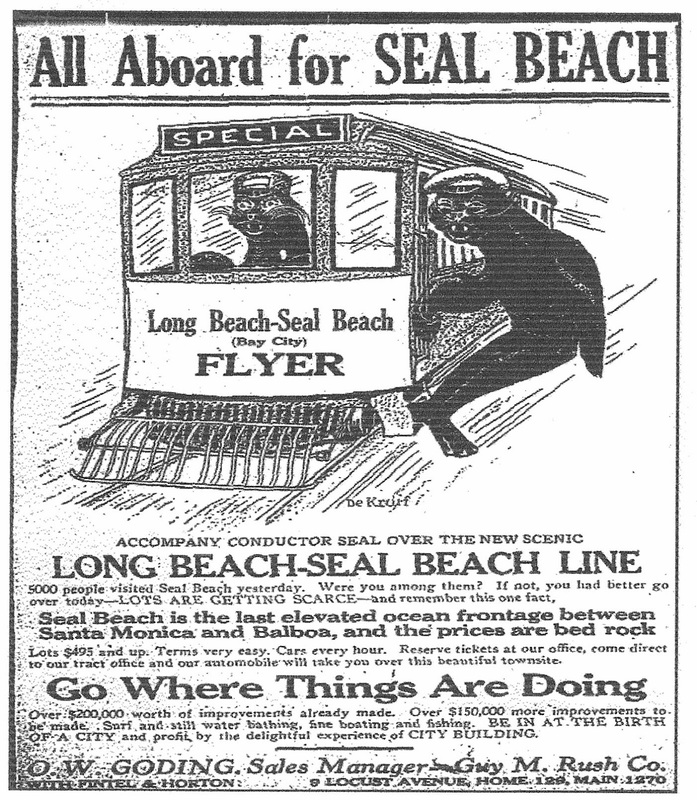 This theme continued until Long Beach and Seal Beach were joined by the new Pacific Electric rail line. The two cities would soon be linked by a trestle being built across Alamitos Bay. 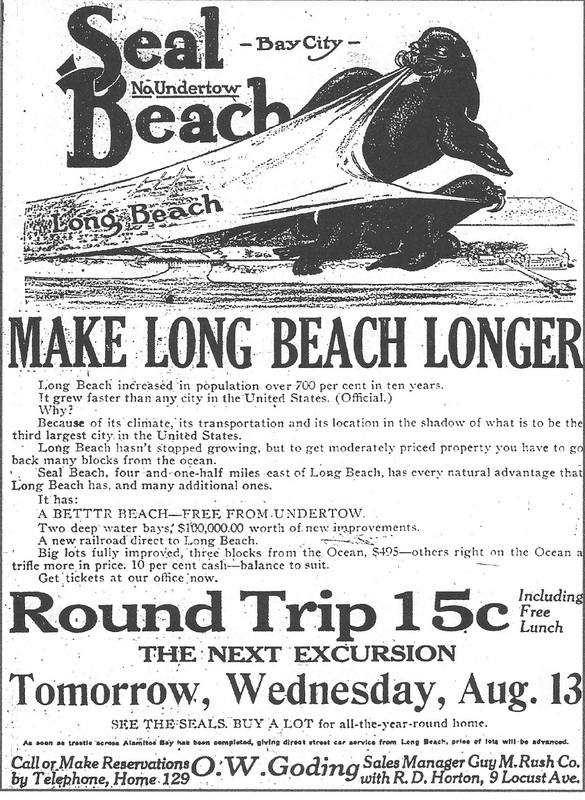 This Aug. 12th ad states: "Make Long Beach longer. Long Beach increased in population over 700 per cent in ten years. It grew faster than any city in the United States (Official). Why? Because of its climate, its transportation and its location in the shadow of what is to be the third largest city in the United States. Long Beach hasn't stopped growing, but to get moderately priced property you have to go back many blocks from the ocean. Seal Beach, four and one-half miles east of Long Beach, has every natural advantage that Long Beach has, and many additional ones. It has: A better beach, free from undertow. Two deep water bays. $100,000,000 worth of new improvements. A new railroad direct to Long Beach. Big lots fully improved, three blocks from the ocean, $495- other right on the ocean a trifle more in price. 10 percent cash, balance to suit." 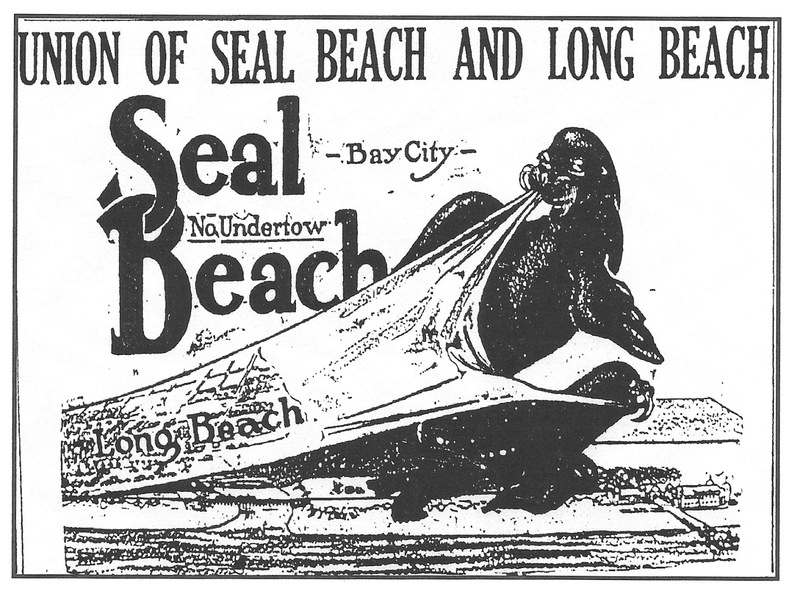 Seal Beach had close ties with the City of Long Beach. Many felt it was just a matter of time before the former Bay City would be annexed to its neighbor. In 1925, legislation was introduced in the State capitol which would permit a city to annex territory situated in another county. Though the bill passed, it was vetoed by Governor Richardson who felt it set a dangerous precedent. Attempts to unite the two cities were not over. In 1929, local Assemblyman Morgan Keaton fought to move the boundaries of Orange County so Seal Beach could become part of Los Angeles County and Long Beach. 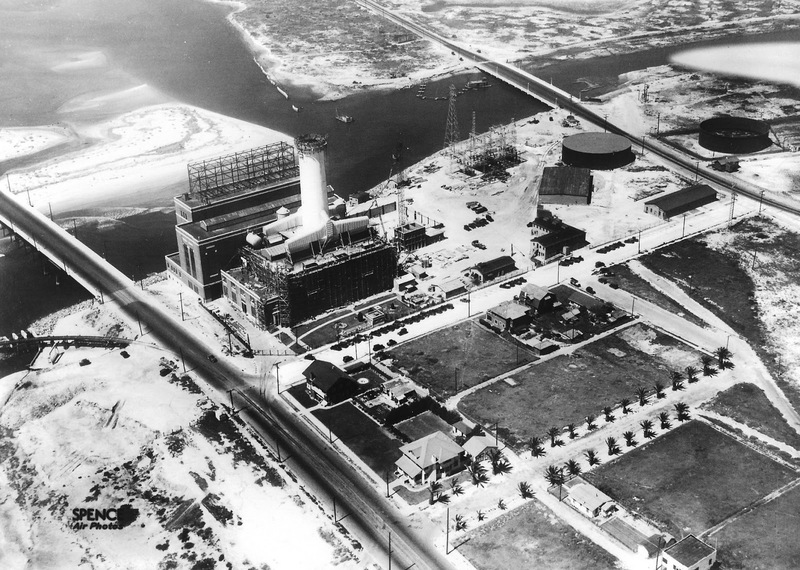 Though residents favored annexation, large interests such as the Los Angeles Gas & Electric Corporation which moved to Seal Beach because it was in Orange County rather than the more regulated Los Angeles County, did not. Keaton failed in his efforts. 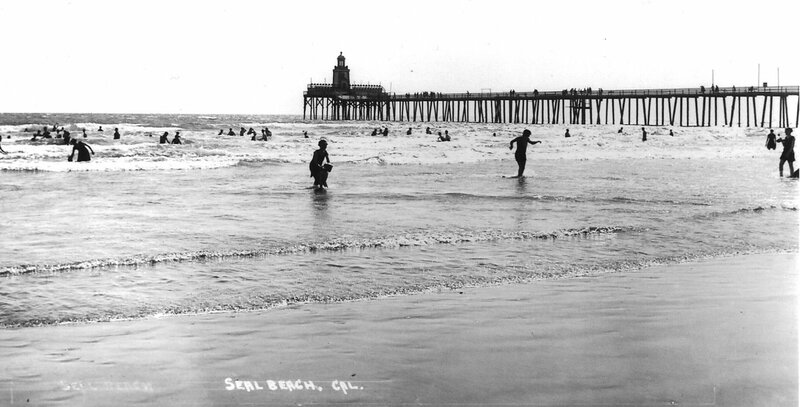 Seal Beach relied on Long Beach for many services, such as sewage disposal and water. 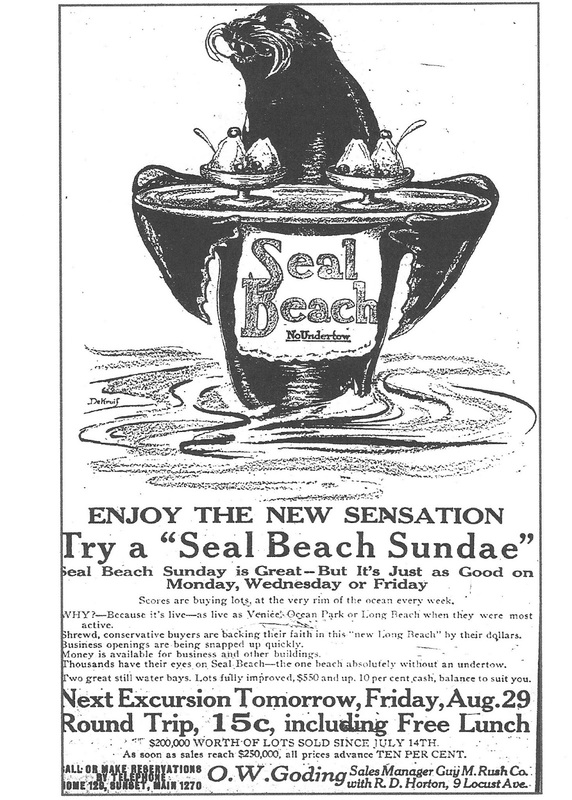 Seal Beach came into the Long Beach water system in 1911, when Long Beach took over the Alamitos Water Company. In 1935, a water bond measure, funded partially with a grant from the Public Works Administration, passed. Seal Beach now had its own water supply. This Aug. 19th ad is one of the earliest representations of a “surf board” in any advertisement: "Get Out Your Surf Board and Join the Seals in the safest surf on the Pacific Coast. Seal Beach lots are selling faster than any in Los Angeles County. Over $150,000 worth of lots have been sold in a month. Why? It's the last highly improved close-in beach near Los Angeles. It's the safest beach in the world, has no undertow. Its climate is ten degrees cooler in the summer and warmer in the winter than Los Angeles. It's only fifteen minutes from Pine avenue, on the new shore line. It's the place for the business man to shed his cares. It's the place for the family to thrive all the year round." On July 11, 1913, world champion Hawaiian swimmer, Duke Kahanamoku thrilled beachgoers in Long Beach with an exciting demonstration of surf board riding.” The famous swimmer and 1912 Olympic champion was in Southern California to compete in a swim meet at the Los Angeles Athletic Club. The Duke, as Kahanamoku was nicknamed, narrowly beat a Long Beach boy, Pete Lenz, who invited the Hawaiian to visit Long Beach. The Duke and his teammates spontaneously gave a thrilling exhibition of surf board riding. Thousands were impressed at the novelty of standing erect on such a board. De Kruif decided to use the popularity of Kahanamoku’s new sport in this ad. The following year, on July 25, 1914, the first surf board contest was held in Seal Beach during the Minnesota Sate Society annual picnic. Contestants started twenty-five yards from shore, where the waves were breaking best, and made a dash to shore, the winner being the “surfer” who first reached the beach on the crest of a large wave. Seal Beach put on her gala attire yesterday in honor of members of the Million Club of Los Angeles. American flags and bunting were displayed an an enthusiastic reception tendered the visitors as the train of special cars pulled in...A band stationed in the handsome new pavilion supplied music for dancing, while to the strains of "Splash Me" and like classics those who were inclined gamboled in the surf and sunned themselves on the beach. At 6 o'clock an al fresco supper was served on the spacious lawns adjoining the home of Phil Stanton...After an impromptu reception at the Stanton home club members were conveyed to the beach where a huge bonfire had been arranged...On the pier, in the wake of the moon, an informal business meeting was called...With the inconstant moon lending its rays, and the broad Pacific as an inspiration, members fancied they could peer into the future and see their plans full-bloomed realities...So when the last gong rang and all were homeward bound --- some reluctantly --- and a few stragglers left with the moon on the beach. This Aug. 21st ad states: "No Life Guards Need Apply. Nature has made Seal Beach safe, safer than any beach known, there is no undertow. Make your home all the year round where the surf is always a joy and never a danger. $150,000 worth of lots have been sole in Seal Beach since July 8 of this year. $100,000 is being spent for the finest pavilion on the coast --- 300 rooms for bathers --- dancing floor big enough for 200 couples. New line to Long Beach giving car every fifteen minutes, to Los Angeles in 44 minutes, will be open in two weeks. Cement walks and curbs, water, electricity, graded streets all in and paid for. Lots have fine soil and are high and sightly." a twin pavilion, which resembled the famous twin pavilion of Atlantic City. This spacious amusement hall, divided into two separate units, was erected at the foot of Main Street. The east two-stories building was 30 x 135 feet and had an entrance facing the beach. On the ground floor was a bathhouse, equipped with a swimming pool, 275 dressing rooms, offices, laundry and drying rooms, and showers, Above it was a dance hall with a street level entry. The west side of the building was 53 x 128 feet and had its entry on Main Street. It contained a bowling alley, cigar stand, and more dressing rooms. The second floor, level with the pier, served as a pool and billiard hall. The pier stood until July 1935, when a sixty-foot section collapsed into the ocean, marooning sixteen on a portion still standing. Thousands lined the shore watching the Coast Guard attempt to rescue the sixteen left on the outer end of the tottering pier. When a Coast Guard cutter arrived, soundings showed the water too shallow to allow the craft to get to the pier. A small boat, which could accommodate only four people, was rowed to the pier and a rope thrown to the marooned group and a boson’s chair rigged to rescue the stranded people. The pier was still the private property of the Bayside Land Company, but things were to change; a new pier and breakwater project was approved with funding from the Public Works Administration. On May 21, 1939, the new 1850 foot Municipal Pier officially opened. The two-day celebration, “Seal Beachcombers’ Frolic,” included bathing beauty and band competitions, swimming and fishing contests, sailboat, paddleboard and kayak races. 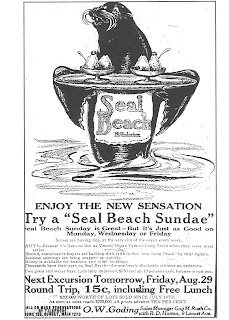 The seal is enjoying his “sundae,” just as visitors would enjoy their “Sunday” by the sea: "Enjoy the new sensation, try a Seal Beach sundae. Seal Beach Sunday is great, but it's just as good on Monday, Wednesday or Friday. Scores are buying lots at the very rim of the ocean every week. Why? Because it's live, as live as Venice, Ocean Park or Long Beach when they were most active. Shrewd, conservative buyers are backing their faith in this "new Long Beach" by their dollars. Business openings are being snapped up quickly. Money is available for business and other buildings. Thousands have their eyes on Seal Beach, the one beach absolutely without an undertow. Two great still water bays. Lots fully improved, $550 and up. 10 per cent cash, balance to suit you." Seal Beach was great fun, a crowd of 80,000 on a Sunday was not unusual. People who came to spend a day on the beach arrived by trolley car, buggies and rattling automobiles that frightened the horses tied to hitching posts along the main street. If one got tired watching the playful seals, fishing or swimming, there were balloon ascensions, parachute jumps and other carnival type entertainment. Seal Beach and Long Beach will be tied together by a new electric car line and the formal opening of this road will take place on Admission Day, September 9. Cars will be operated every twenty minutes in both directions. The trestle work over Alamitos inlet has been completed and the Pacific Electric Railway is now rushing the work on a fill at either end of the trestle. Ties and rails will be laid early in the coming week and it is hoped to have the trains operating regularly by Admission Day.